For such a new character (he debuted in April 2006), Jaime Reyes is really rolling in the action figures. He got his first toy from DCD barely a year after his first appearance, and after appearing on the debut episode of Batman: The Brave and the Bold, he's become a mainstay of that show's various toylines, as well. Now it's DC Universe's turn to share the love. When the Rock of Eternity exploded, the alien scarab encased within it fell to Texas and bonded to Jamie [sic] Reyes' spine, making him the 3rd Blue Beetle. Jaime found that with a mere thought, he coukld use it to generate armor, tools and weaponry. He also learned the scarab was an advance agent for an expanionist alien species, that had bonded with Jaime. Together they beat back the alien attacks and Jaime's heroic efforts earned him a spot in the Teen Titans. Just for the record? The kid's name is Jaime Reyes, not Jamie Reyes. He's hispanic: his name's pronounced "Hy-may," not "Jamey." It's an easy mistake to make, and only shows up once on the card, so no points off for that. 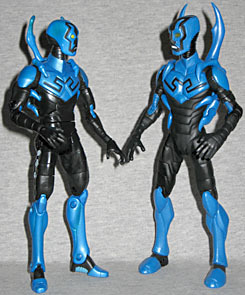 After all, Mattel's going to need all the help it can get: DC Direct's Blue Beetle was the 2007 Toy of the Year, so the bar has been set pretty damn high when it comes to 6"(ish) versions of the fourth Blue Beetle. Given Mattel's track record and everything we know about this company, you could reasonably expect this figure to be a disappointment. Oh well, we're still going to review him anyway, so let's grit our teeth and get to it. Blue Beetle was designed by Cully Hamner, and has a distinct, armored look. That means Mattel couldn't just re-use one of their existing bodies. There is nothing on Jaime from head to toe that came from any other figure - and if we're being honest, the future potential for reuse is almost nil. Who else is really skinny and covered in armor? We certainly can't think of anyone. The plates of the armor overlap properly: it's a very specific design, and the Horsemen didn't cut any corners. The interiors of his elbows and knees look like flexible panels, and they even made his fingers slightly more square than usual. His scarab backpack isn't removable, but on the plus side, you don't have to worry about it falling off. The paint's very nice, as well. The black sections of the costume are given a glossy finish, but it's not a high gloss: they relfect light, but not as though he spent his off time polishing them with a can of Turtle Wax, you know? Conversely, the blue has a metallic sheen. There are lighter blue panels on the bottoms of his feet, and pale blue circles running up his legs. His mouth is white, and his eyes are blank yellow. Now we move on to the articulation, which for the DCU line is always an unsurprising retread of the same old-- wait. Wait just a minute! Is it possible? Can it be? Mattel has finally made a figure with double-hinged elbows and knees! This is truly a day of celebration! He gets all the joints you'd expect, but those extras in the arms and legs are just wonderful. Way overdue, but absolutely welcome. He even gets swivel/hinge wrists like Green Arrow did, but hot diggety daffodil are the double-hinges a great surprise! At last, Mattel has given a Four Horsemen design the modern articulation it deserves. Some of the plastic is a bit "gummy," but none of the joints stuck or sheared when I moved them. The balljoints in the neck even work, allowing Jaime to look up when he flies. And yes, fly he can! 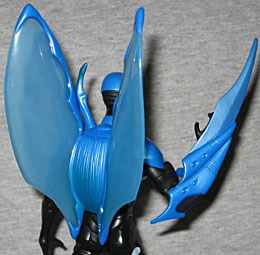 While DCD's figure had two separate shield-halves that could be attached to the back of the arms, Mattel has opted for a single translucent blue piece that plugs into the scarab to give him wings. They're not as large or as poseable as the first toy's, but the design makes up for it. To show the way Jaime's suit morphs to create its own weapons, he comes with a highly detailed blade that fits onto his forearm. Unfortunately, safety regulations mean that it's molded from soft PVC, so the clip that fits onto the figure's arm never really grips on tightly. Don't worry, with some work, you'll be able get it to stay where you want it. DCU Series 13, like Series 12, includes 75th Anniversary collector buttons - Blue Beetle's pin shows a piece of the cover from Justice League #1, and while it does include a Blue Beetle, it isn't this Blue Beetle. Mattel's never said the pins were intended to match the character in the package, but you really have to think it would make more sense if they did. Jaime's also got a piece of the Series 13 BAF, Trigon. It's the left leg, a giant red and white piece that suggests whoever Trigon is, he's a giant ice cream man. There's no sculpted detail on the leg: yes, there are muscles, and wrinkles around the ankle, but it's not like the top edge of the boot is sculpted in. Surprisingly, we haven't seen a comepletely "plain" BAF leg like this yet - the closest was Atom Smasher, and he had big thick boots. 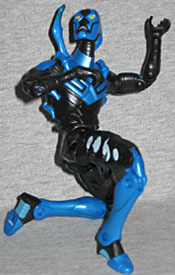 Like we said, DC Direct's Blue Beetle was the best toy of 2007, so Mattel had a lot to live up to. Shocking absolutely everyone, they have risen to the challenge. 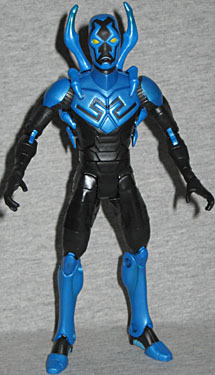 Blue Beetle isn't just a 2010 ToY contender, he's the best 6" figure Mattel has ever made. Thank you, thank you, thank you, Mattel, for finally taking a step forward and joining the rest of us in 2010. But be warned: now that we know this level of quality isn't beyond your reach, we're going to be raising our expectations. This is the kind of figure you should have been making from Day One of DC Superheroes. It's time to step up.